Repairing a corrupted USB flash drive is easy today .Follow Flash drive repair tutorial to learn how to fix a malfunctioning USB flash drive that not recognized by computer or have format issues . 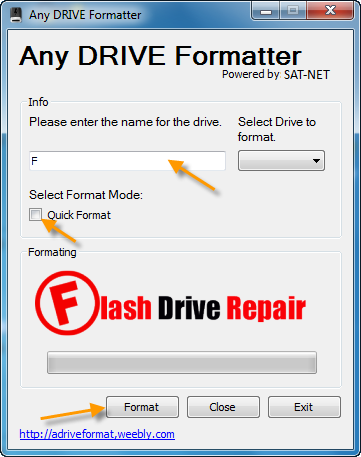 First step of our USB flash drive repair tutorial is fixing the flash disk without formatting because may be it have important files so you need to save them .there is many reasons that can make USB pen drive data to be inaccessible as example USB flash drive not working , not detecting ,format error message appears every time you connect the flash drive . 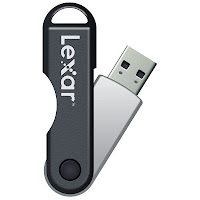 So now the question is how can we recover the important files from the USB drive when it is damaged or unresponsive? .We will offer 45 way to repair corrupted USB flash drive and you can try it one by one until you get back your Flash disk . We can use this way before we do anything , may be is unable to assign drive letters (like C, D, E) to the flash drive . Because of that reason we can't access the data inside our pen drive .To fix this issue please follow the instructions below . 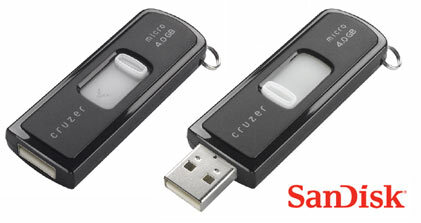 How to change USB Flash Drive Letter from Windows ? 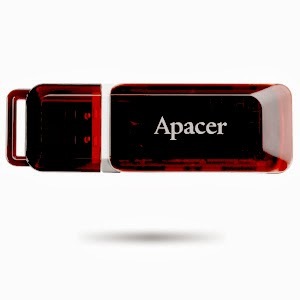 Plug in USB pen drive to your Laptop or Computer . Right Click on Computer then Choose Manage . Click on Disk Management ,you will see all storage device connected . 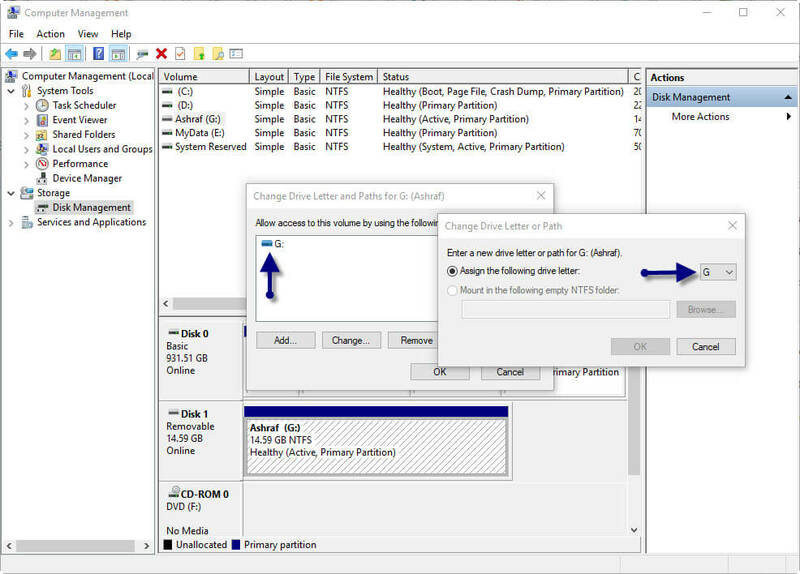 Right Click on your USB flash drive then choose "Change Drive Letters and Paths ..." . Click on Change then Choose another Letter to assign to your flash disk . Remove your flash disk then plug in again . Try to open it now .If this way not worked please use the next method . 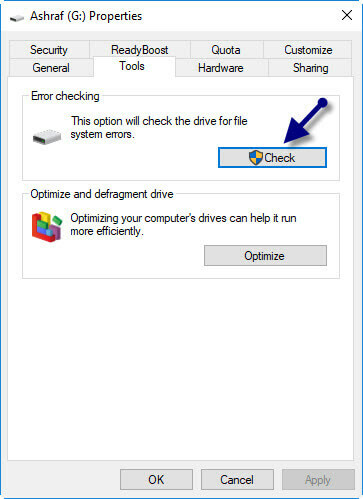 Sometimes there is errors with the flash drive and needs only to be corrected not formatted .In this method we use the simple Windows error checking "Scan and Repair drive " . Connect your flash disk to your PC . Right Click on flash drive then choose properties . 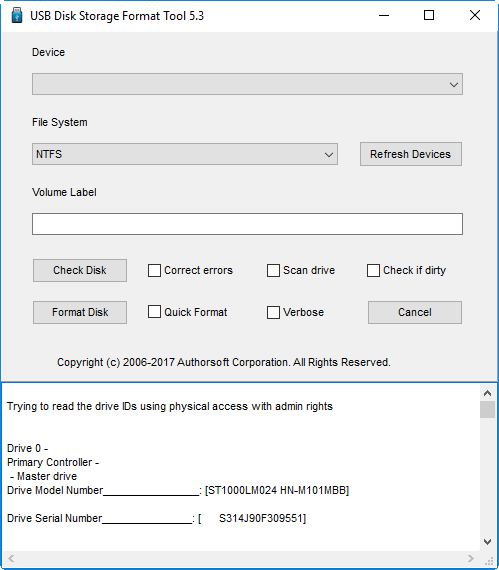 Click Scan and Repair drive . Wait until finish , don't remove the flash drive while repairing . We will use this method if we plug in the flash drive to PC USB port and computer not able to detect it .You can uninstall the flash drivers from Windows then reinstall it .This method may fix the flash drive problem . Insert your corrupted USB flash disk to your PC . 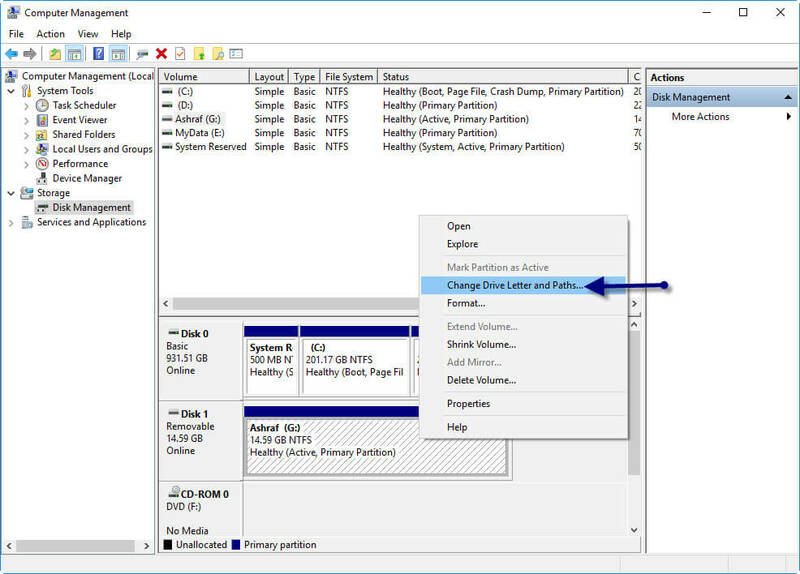 Right Click on Computer and choose Manage . from the left side click on Device Manager . Click on Disk Drives . Right Click on Your flash drive . Computer will automatically reinstall the flash drives and it will work good . 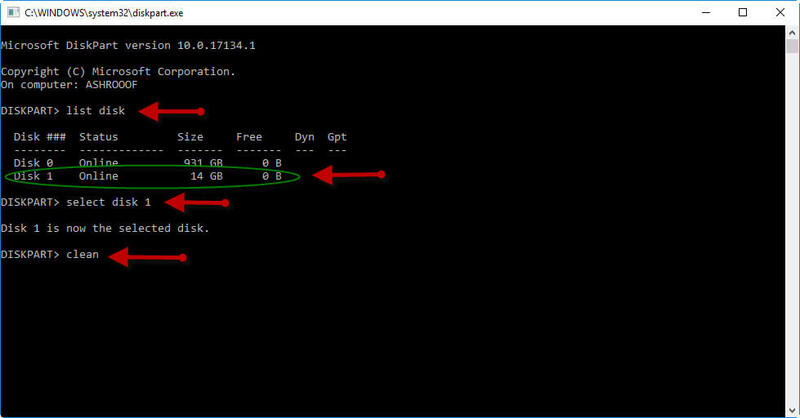 We can use CMD for recovering damaged USB flash drive without formatting . 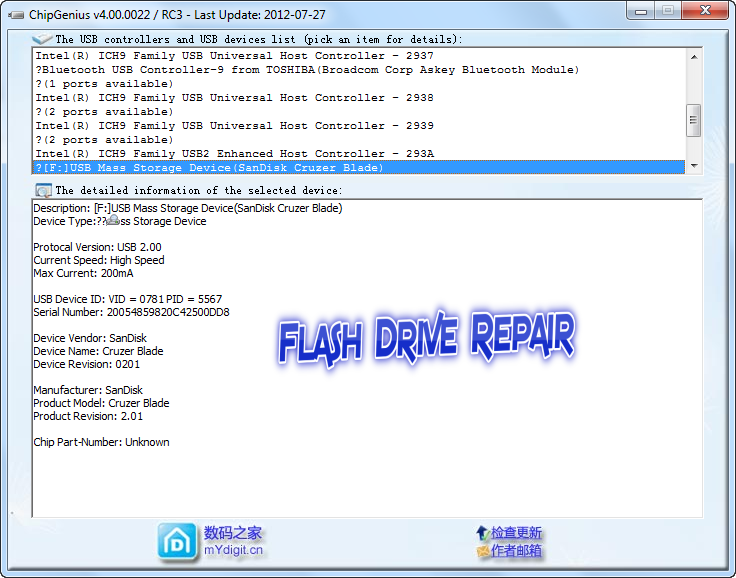 CMD allows you to repair a corrupted USB flash disk without losing data inside. Insert your flash drive to your computer. From Start Menu ( i use Windows 10 ) search for Windows System then right click on Command Prompt then click on Run As Administrator . CMD Windows will open . Type this command chkdsk G: /f G is your flash drive label . Press Enter , CMD will correct all flash drive errors without formatting . 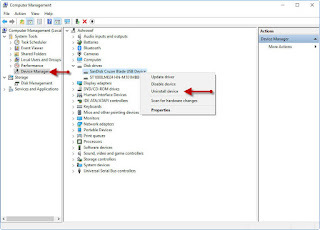 Sometimes there is different reasons that make the USB flash drives not recognized by computer .One of this reasons is USB Port may be isn't works good so in this case try different USB port .Another reason try to plugin USB flash drive to another PC and another operation system .If you try it in Windows 10 so try it in Windows 7 . 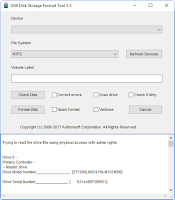 This method can fix the corrupted USB drive by restoring the default format type . Right click on your Thumb drive then choose format . As you see in the picture remove Quick Format . 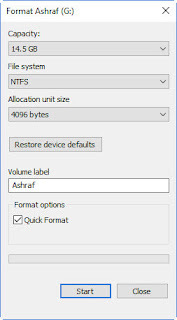 Click on Restore Device defaults ,you will see that the file system format changed to the original file system of the flash disk "sometimes become FAT32 " . 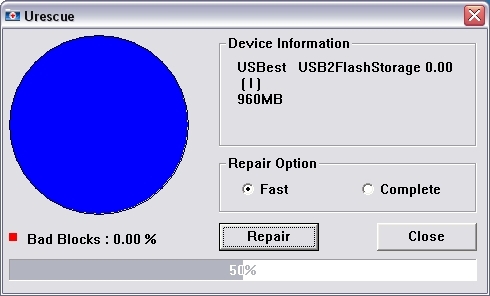 Click Start to begin the full format of the flash disk . This method will clear all errors from the pendrive . 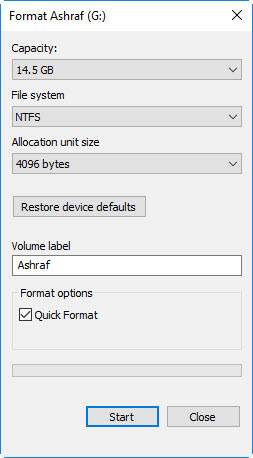 This method (DOS Method ) will be used to repair corrupted USB flash drive by making Full format (force format ) to the flash drive by using Diskpart command by CMD .This method can format and repair all corrupted flash drive types . 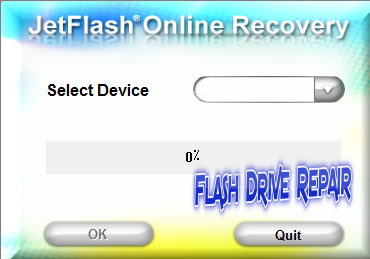 Insert your corrupted flash disk to your PC . 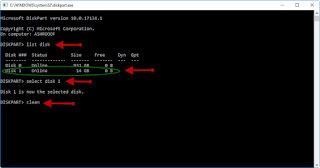 Right click on command Prompt and Run As Administrator . CMD Window will open , type diskpart then press Enter . 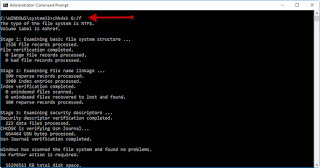 Another CMD window will open .Type " list disk " then press Enter . You will see all disks that connected in your PC. Disk 0 is your computer primary HDD , so look to the other Disk ant it's capacity . Type " select disk 1 ( flash drive disk ) then press Enter . type "clean " then press Enter . Wait until format your flash drive . Congratulations now your USB flash drive fixed and formatted well . 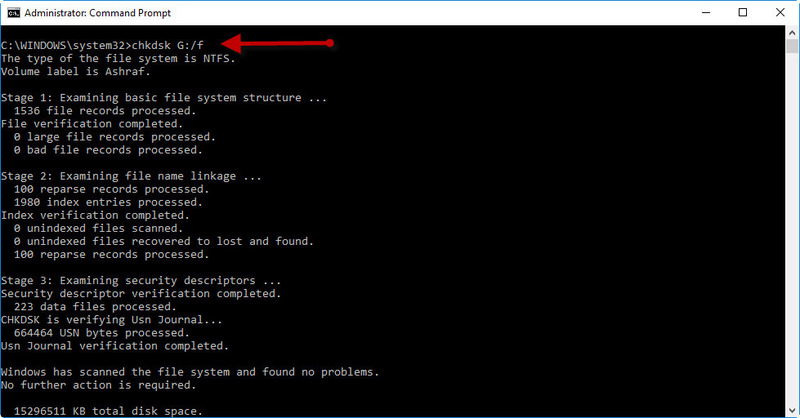 Windows format tool is one of the USB format tool that can repair your corrupted flash disk .It is very simple tool and you can find it with your Windows operation system . Plug in your thumb drive to your computer . Open My Computer then Right click on your thumbdrive . 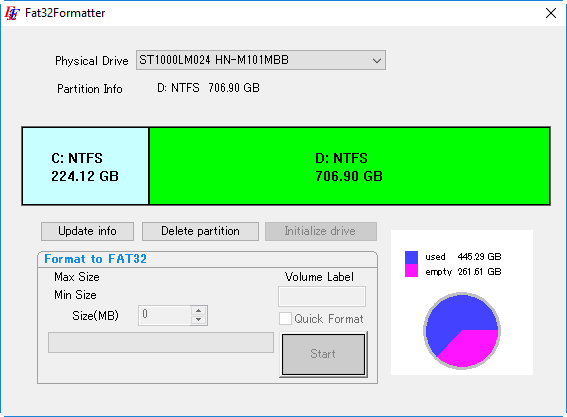 Choose format type NTFS or FAT32 . If you want a Quick format check "quick format " or unchecked it and do deep format but it will take more time than quick format . Wait until finish formatting your thumb drive . 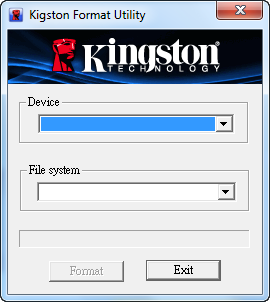 HP USB Disk Storage Format Tool 2.2.3 is a portable software designed to format USB flash disk and SD memory cards . 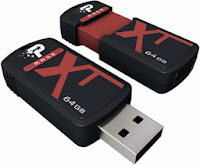 It allows you to format any USB pen drive in FAT, FAT32 and NTFS file systems .Another option of portable HP USB Disk Storage Format Tool is making bootable disks that can help boot a PC. Portable Hp USB Disk Format Tool support repairing the following storage devices "SDHC, SDXC Memory Stick Duo Pro, CF Card II and Compact Flash ,SanDisk ,Kingston Transcend,Corsair custom USB flash drives ,HP ,Sony ,Lexar Imation ,Toshiba,PNY ,ADATA ,Verbatim ,Kingmax,LaCie , Apacer,Panda ,Seatech ,SDKSK9 ,Silicon Power disks,IronKey custom USB flash drives,HDE pen drives and more . HP USB format tool looks like the Normal Windows Format tool in it's program interface and the same steps of formatting process . 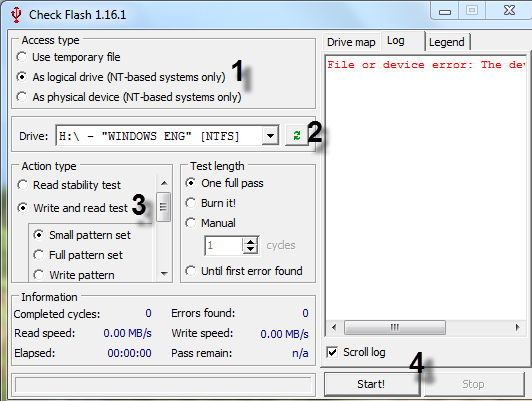 Check Flash 1.16.1 format tool supply a very useful tool for your corrupted USB flash disk checking. You can check the read/write speed of flash device, edit partition info, save and restore full drive and partition images beside MBR. You can perform a full drive or partition cleaning and testing at the highest with high speed. 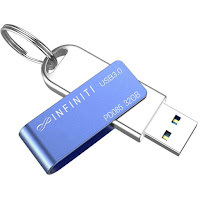 USB Disk Storage Format Tool V5.3 is a free format utility helps users to format and repair their corrupted USB sticks .The Authorsoft utility can perform a low level format for USB flash drives that have format errors such as " Disk is write protected error Message , Please insert disk error message , Format disk error message ,raw file flash drive error and other format issues . 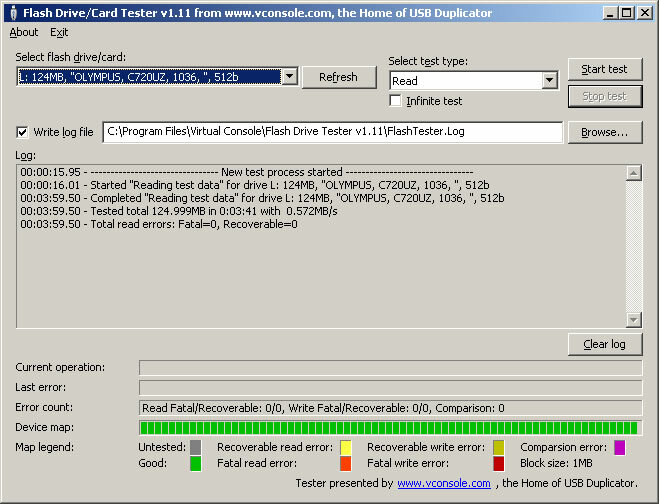 USB Flash Drive Tester is a free software to test and repair corrupted USB flash drive sectors.USB flash drive tester software allows to you to test any removable disk such as memory card , mmc,cf and USB flash drive .This software can perform speed scan for bad sectors in your removable disk.Another advantage of this software is you can determine fake sizes of usb flash drive .The different benefit in USB flash drive tester software is supporting windows vista,7,10 . 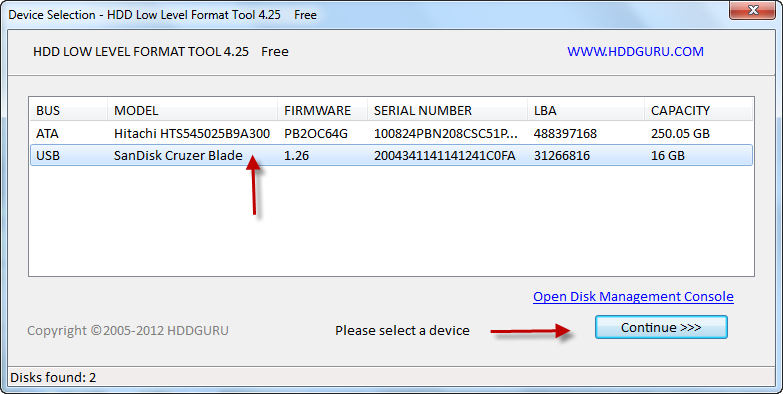 HDD Low Level Format Tool is a free software has been programmed by hddguru Software .HDD low format tool can perform low level hard disk format also you can format any corrupted USB Flash drives that can't be formatted by HP USB Disk Storage format tool or any other format software . 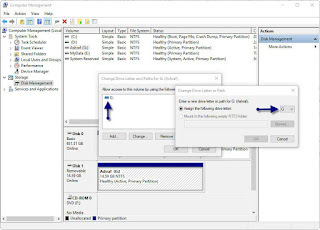 HDD Low Level Format Tool software can repair hard disk sectors and clear partitions ,MBR and all data inside the hard disk for ever .HDD low level format software support the following operation system "MS Windows XP, Vista, 7, 8, Server 2003, 2008, 2008R2 "
Open Martik USB Disk Formatter software .From the upper menu called usb device , choose your flash drive .Choose your format options from "system" weather FAT or NTFS .Press format to begin flash drive formatting process .Please wait until finishing formatting . Urescue format tool support formatting many USB flash drive such as AData flash drive .Insert your flash drive to your computer then open Urescue formatter tool .If your USB flash drive is supported by Urescue format utility , you will see the previous picture .If Urescue format software doesn't support your USB flash drive , you will get this message (device not found ) . 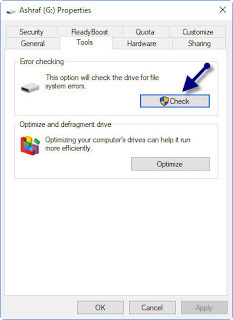 Sometimes when you try to open your USB flash drive , It not open and we got error messages such as "Please insert disk " , "Disk is write protected ",No Disk ,Format your Flash drive .When you format the flash drive by Windows normal format ,You got another error message "Windows is not able to format disk ". 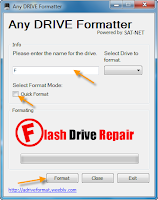 To repair USB flash drive formatting problems use Any Drive Formatter Tool .Any Drive Formatter tool designed to format any corrupted usb stick .Any Drive Format utility is ver simple and looks like Normal Windows format tool . 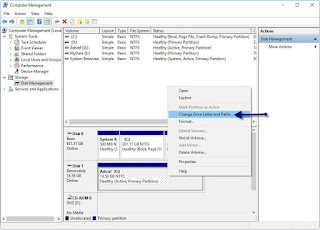 Smart disk Fat32 Formatter utility is a great format tool for formatting your HDD ,External hard disk ,Memory card and USB flash drive.Smart Disk Fat32 format tool convert your files system type to Fat32 with one click .Smartdisk Fat32 format utility can repair Corrupted HDD and USB flash drive .This tool can format your large hard disk in short time to Fat32 .Also you can use SwissKnife software to format and repartition your hard disk ,read this article "how to create usb flash drive partitions". 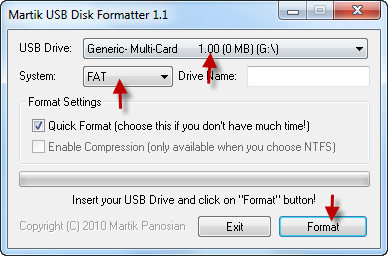 MiniAide Fat32 Formatter is a free FAT32 format tool designed by MiniAide Tech Development Company .Fat32formatter utility can format storage devices more than 32 GB with FAT32 file type such as USB flash drives , HDD ,external hard drive ,SD memory cards and more .FAT32 format tool allows user to check Disk partitions errors, initiating a disk defragmentation process, moving or resizing it. 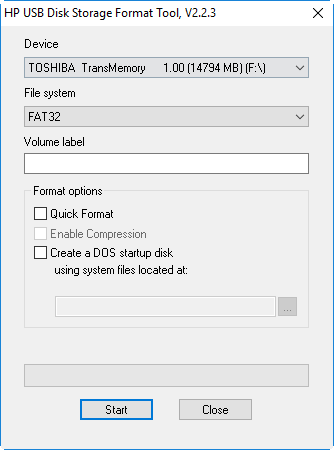 Tokiwa FAT32 Formatter is a free Portable FAT32 format tool allow users to format any disk storage larger than 32 GB to FAT32 .Fat32 Formatter v1.1 support Windows 2000, Windows XP,Windows 7 ,Windows Vista ,Windows 8 ,Windows 8.1 and Windows 10 . 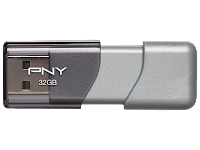 The first step of flash drive repair is determining your USB flash drive information to know which repair software will be suitable for this flash drive . 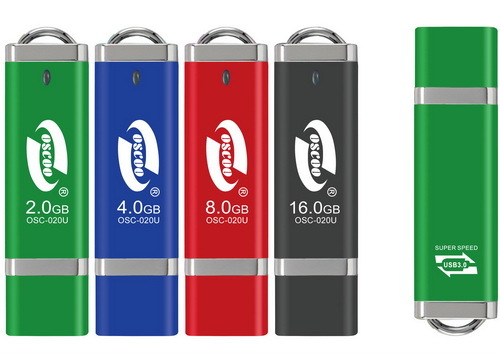 To determine Flash drive information you can use many software such as ,Chip genius ,flash extractor , chip easy and many flash drive software but i prefer using Chip genius software . 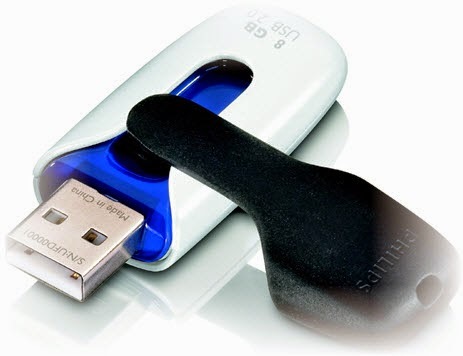 Now plug in your corrupted USB flash disk to your computer and Download Chip Genius from this link "Chip Genius Software v4.17" . If the Chip genius detect the flash drive information correctly , You will get Chip vendor ,Chip Part- Number so we can repair the USB stick by Update firmware ,this means a software solution .But Sometimes Chip genius report doesn't show chip vendor ,chip part number or write unknown , in this way there is a hardware solution to make the flash drive recognized by computer and chip genius then use the software "we will discuss it after finishing the software part ". Search in Google or in our flash drive repair website to find the suitable software . You can Download Corrupted USB flash drive firmware from our website ,just determine your flash drive chip vendor and choose from the following firmware labels . 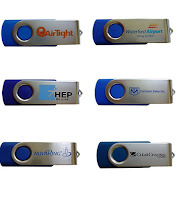 In this section of our Flash drive repair guide we will put the famous branded USB flash drives format tools that was produced by it's official company . Kingston format tool allow to format and repair any Kingston or data traveler USB flash disk .It's a free portable format tool designed by the official company of Kingston USB Flash drives . 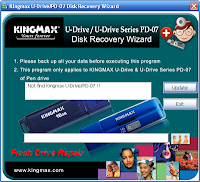 Kingmax recovery tool was designed by Kingmax Company to fix it's corrupted USB flash disks .It is very easy tool and work 100%.Kingmax Super Stick Recovery Tool V1.0.2.19 support most of Kingmax flash drives. 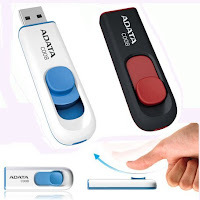 ADATA USB Flash Disk Format Tool allows to format any type of AData USB flash drive.ADATA Format utility provide a low level format that can recover the default factory setting of ADATA flash drive . 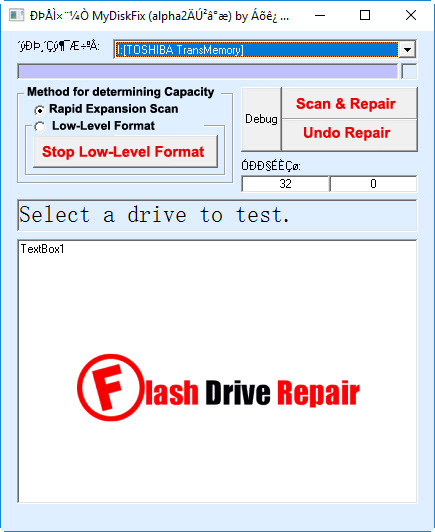 Transcend Jet Flash Online Recovery tool is a new software tool developed by Transcend USB Drives Company to repair and format Transcend Jet Flash USB flash drives that have formatting problems and write protected problems . 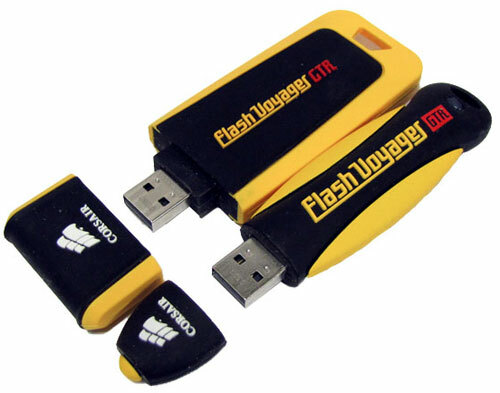 If you have a Transcend flash drive or Jet Flash drive and not working Properly so you must use jet flash online format tool .Transcend format tool has many version that suitable with every jet flash model such as JetFlash 620 ,JetFlash V15 ,JetFlash 200,JetFlash 220 . Lexar format tool was designed to format any corrupted Lexar USB pendrive .Lexar format utility support most of Lexar USB drive models . Silicon power formatter v 3.7 ps2251 can repair silicon power USB flash drives with chip vendor ps2251 in one minute .Insert corrupted silicon power USB flash drives to your computer .Open Silicon power formatter v 3.7 ps2251 .If your USB flash drives is supported ,You will see the previous picture .Press format to begin updating USB flash drive firmware . Silicon Power recovery tool is a good recovery tool for brand of innostar USB custom flash drive .Silicon Power Recovery Tool software can repair and format any corrupted innostar USB flash drive .Insert innostar custom flash drive to your computer .Open Silicon Power Recovery Tool software and press start to begin updating your innostar custom flash drive firmware . 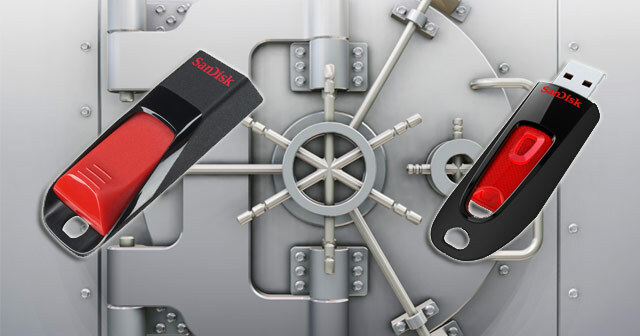 Sandisk Recover disk generator tool allows you to fix most of corrupted Sandisk flash drives.It support the following flash drive controller chip vendors :OTI 2168 ,OTI 6228, 0151 - Silicon Integrated Systems Corp , 5151 - SanDisk . 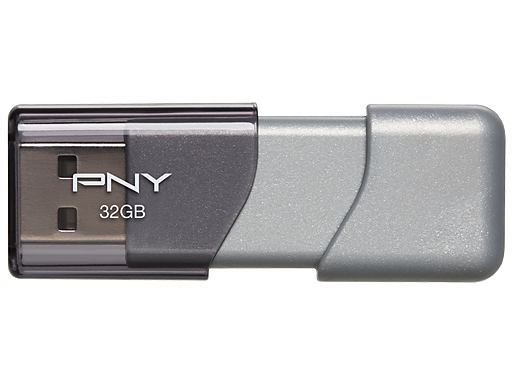 PNY USB Drive recovery Software can recover and repair corrupted PNY 16GB or 32 GB flash drives .If you have corrupted PNY Flash drive 32GB or 16 GB,Fix it now with PNY Format tool . Apacer format tool help you to repair and format apacer flash drive if you have formatting problems or write protected or this message "Please insert the disk" when you double-click the USB Flash Drives .I bring to you all apacer flash drive repair tools .Follow the next tips to fix corrupted apacer flash drive . JMMassProd format utility can fix the following flash processor type,Micron processor,Samsung processor,Toshiba processor,Hynix processor and Intel processor . Do you have a corrupted Infinity USB flash disk and you want to repair it .Do you get this error please insert a disk into removable disk .Here is the solution with super stick recovery tool . Formatter Silicon Power v.3.7 is an effective tool to repair Toshiba Smart Buy Glossy 4GB that have PS2251 chip vendor .Download Formatter silicon power software to your PC .Insert your Toshiba Smart Buy Glossy 4 GB , Vid=13FE ,Pid =4100 with Toshiba processor to computer and open Formatter silicon power software. Ameco MW8219 firmware software is an effective utility to format or repair any Udisk JV60 flash drive .Just download Ameco MW8219 firmware software to your PC.Plug in your corrupted USB flash drive to your computer.Open Ameco MW8219 firmware software and click start to begin updating your flash firmware. 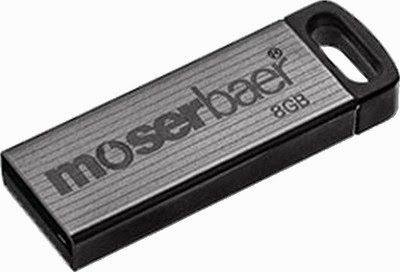 Today we will explain how to repair MoserBaer USB flash disk .If you have a corrupted Moser Baer flash drive don't through it , you can fix it now and make it like a new one .MoserBaer Upgrade Tool is designed to update MoserBaer 8GB flash drive firmware . MoserBaer format tool will format your flash drive . 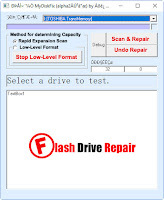 Philips UFD Upgrade Tool is designed to repair and reformat Philips Vintage 8GB flash drives .Philips Vintage 8GB format tool can fix Philips USB flash drives format errors such as write protection problems and format errors .Philips Auto format tool will support reformat Philips Vintage USB flash drives with 8GB only ,So please don't use it with another USB flash drives . 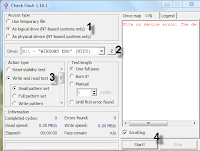 If you open your flash drive and get this message "E:/ is not accessible the file or directory is corrupted and unreadable ".Here is the solution of File or directory is corrupted and unreadable error message .The solution is very simple and don't worry you will not lose anything from the data inside the flash disk .Just follow the tutorial . 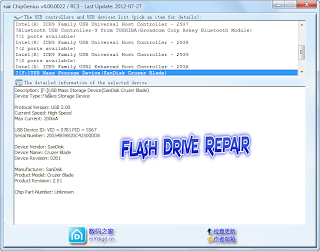 Thank you my friends now we get the end of how to repair corrupted USB flash drive .Please share this article with your friends so they can fix their corrupted flash disks .We will update this article if we have new format software .